That was the simple yet groundbreaking question William T. Vollmann asked in cities and villages around the globe. 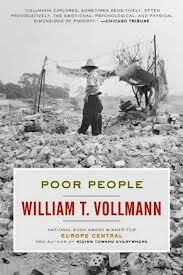 The result of Vollmann's fearless inquiry is a view of poverty unlike any previously offered. Poor People struggles to confront poverty in all its hopelessness and brutality, its pride and abject fear, its fierce misery and quiet resignation, allowing the poor to explain the causes and consequences of their impoverishment in their own cultural, social, and religious terms. With intense compassion and a scrupulously unpatronizing eye, Vollmann invites his readers to recognize in our fellow human beings their full dignity, fallibility, pride, and pain, and the power of their hard-fought resilience.